In order to remain a riddle, this book should not have a prospectus. However, once the work has been viewed, further description may be helpful. 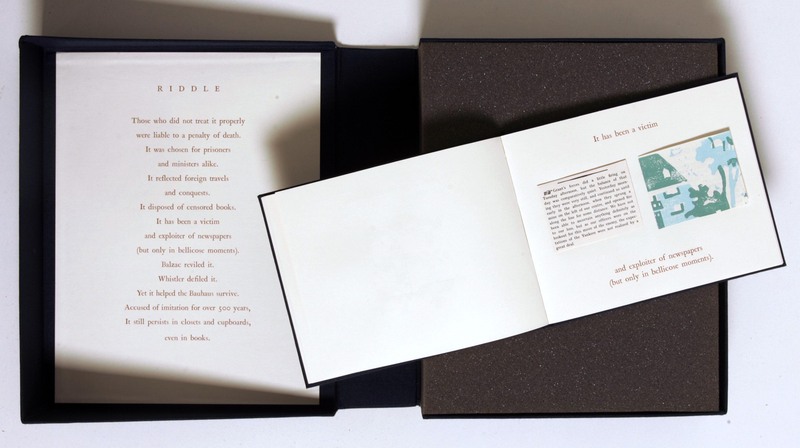 The colophon divulges that Riddle is about wallpaper, and sample books, researched in the print room of the Victoria and Albert Museum as well as in published sources. 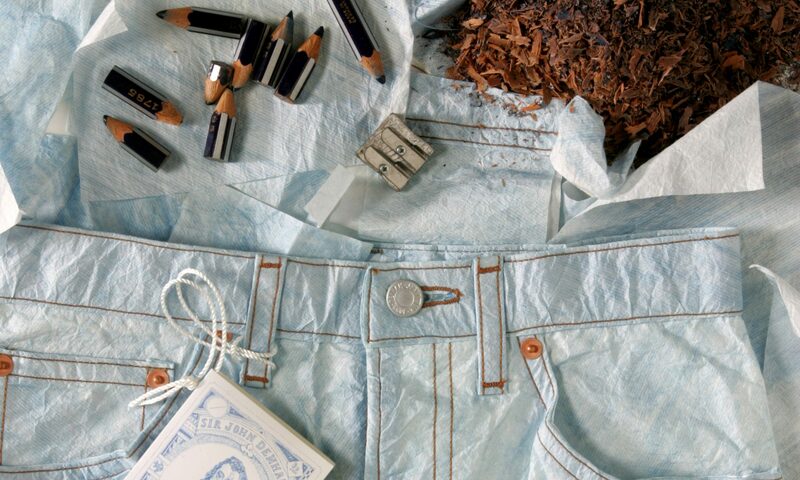 The format of this book draws upon experiences viewing wallpaper and sample books in the V&A. Pieces of gray foam are brought out with each work to protect the prints or books, and the material to be viewed arrives in mysterious clothbound clamshell boxes. Until the box is opened, it is not known whether what inside corresponds to what was ordered, and how it will appear. These elements are present here, and this format allows the viewer to read the text of Riddle once through, before seeing a single scrap of wallpaper. In that way, it succeeds in being a riddle, without premature clues. Once the book is discovered within the foam, the text unfolds line by line, this time illustrated by a piece of wallpaper, except for the first page, which shows a reproduction of a wallpaper tax stamp from the 1700s. This excise duty stamp is composed of the monogram of The Georges, and is one of several stamps occasionally found on the back of wallpaper from circa 1712-1812. Wallpaper manufacturers that did not comply to the taxation laws were subject to the death penalty. Wallpaper was chosen for prisoners and ministers alike in the rooms of the Houses of Parliament. The V&A houses a period pattern book of 179 cuttings of wallpapers designed for the Houses of Parliament from 1851-1859. The red and yellow linocut illustrating this line is from a committee room in the House of Lords. 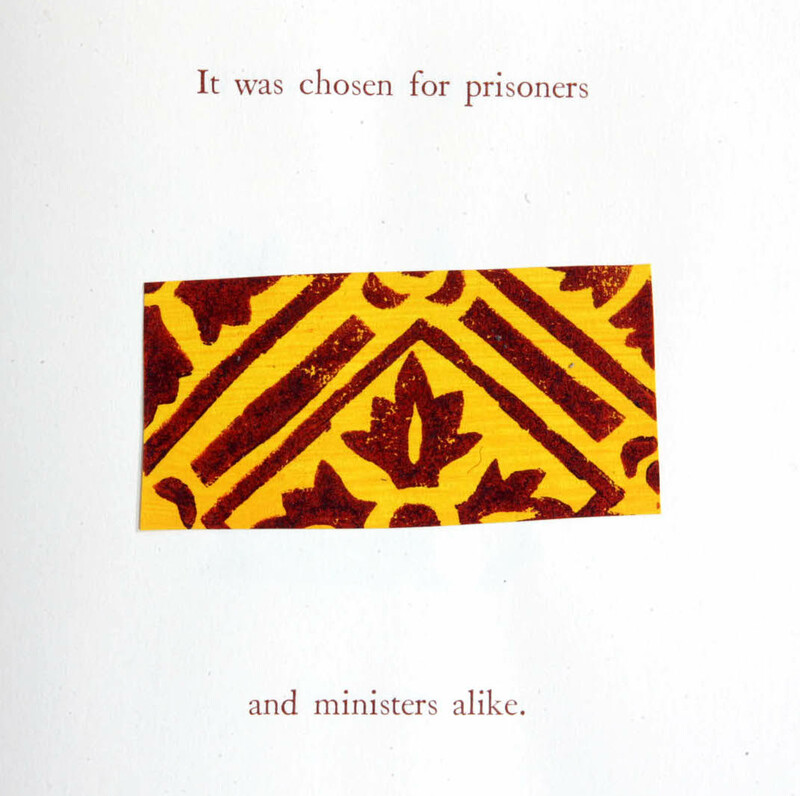 The last sample in the book is a green linocut designed for a prison room in the House of Lords. Wallpaper reflected foreign travels and conquests as did textiles and prints in centuries past. Reproduced here is a piece of a crimson flock paper from the early 17th century from the V&A with axe-carrying natives, palm trees and pagodas. Exotic scenes and daily life of the orient were very popular, and later archeological discoveries in Italy and Egypt inspired 19th century designs. British wallpaper damasks and faux marbles carried names of foreign cities as well, and even today they still do, enticing would-be decorators with romantic ideals. Published works deemed unfit for circulation were confiscated and used as a ground for wallpaper in the 1600s in England. Thomas Hobbe’s Leviathan was one such censored work to be temporarily obscured by wallpaper. Searching for an appropriately caustic passage, it was hard to choose from the many witty and scathing lines. At last, part of an analogy between the Church and fairies, or supernatural beings, was selected, though the whole hilarious section, found at the book’s end, merits reading. The wallpaper is a linocut of an Italian domino from the 1600s housed in the V&A. During war, when materials are scarce due to sieges or rationing, even wallpaper has been involved. During the U.S. Civil War, a single-sheet newspaper from Vicksburg, Mississippi with the title Daily Citizen from July 2, 1863, was printed on pages from a wallpaper sample, due to lack of paper supplies in the Confederacy. A facsimile of the text was printed by Stamperia Valdonega, and the pale pink linocut was copied from a British Library publication, where this document is preserved. During World War II, however, it was wallpaper that exploited newspapers. Newspapers were collected for the printing of wallpaper as no new materials could be used for that purpose. 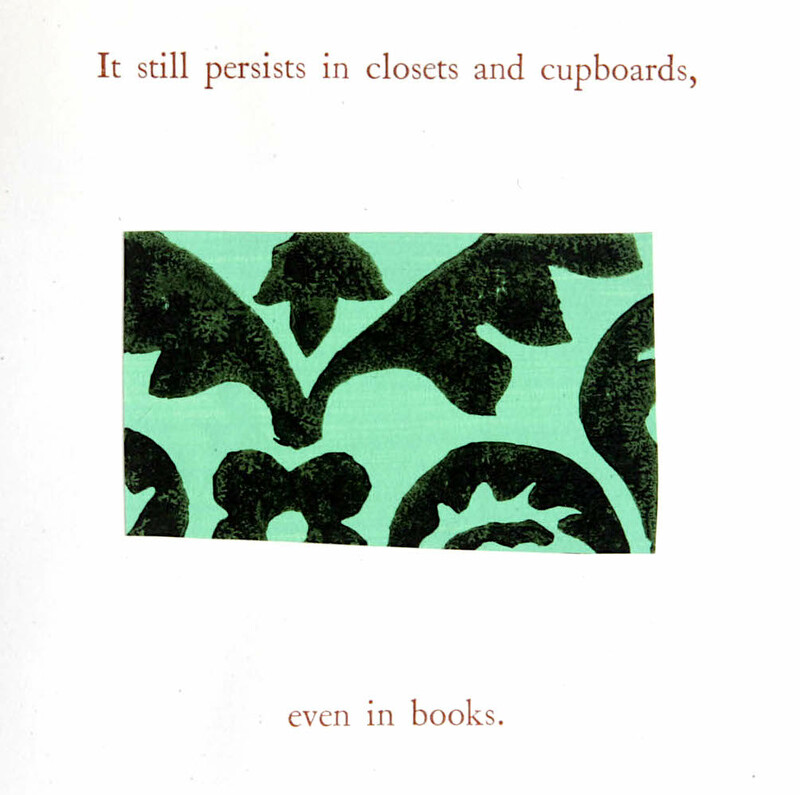 One American wallpaper book produced during the war informed the consumer that “Wallpaper uses valuable dyes, inks, and paper stock. The Government has issued a limitation in order to conserve the critical materials for war use.” To draw attention to the problems of consumption and rationing during the war, a fragment of The New York Times “Week in Review” from Sunday, September 6, 1942, was chosen to represent the era, printed by Stamperia Valdonega. The linocut printed on the back of The New York Times facsimile is a copy of an American wallpaper from the 1940s stripped off the stairwell of a house in Beverly, Massachusetts. Many authors and artists have criticized wallpaper for its ugliness or propensity to depress people, including Balzac, Oscar Mirbeau, Oscar Wilde, and Charlotte Perkins Gilman. Whistler took the liberty of painting on top of a very expensive leather wallpaper lining the walls of what was to become the Peacock Room, commissioned by Frederick Leyland in 1876-1877. The wallpaper would have conflicted with Whistler’s complete decoration of the room, but his impulsive act infuriated his patron, and created a lawsuit as well as a public spectacle. The Bauhaus revolutionized wallpaper from 1929-1932, creating subtle textures, colors, and patterns very modern in appearance. These wallpapers also created an important source of income in the form of royalties. The papers illustrating these figures and movements are represented by a linocut copy of a French wallpaper from 1799 for Balzac, with an “x” and the word “discontinued” canceling it, as is found in marked up sample books from factories and producers. The original is in the Musée des Arts printed to simulate the textured wallpaper, with a blue-green acrylic tempera painted on top. The Bauhaus papers are evoked on the following page with layers of textured collographs in subtle colors. were liable to a penalty of death. It disposed of censored books. (but only in bellicose moments). Yet it helped the Bauhaus survive. is based on experiences researching wallpaper in the print room of the Victoria and Albert Museum, and upon published sources. It is the second work in a series on sample books, but the first in a series on wallpaper. Letterpress in Caslon, an English typeface accused of imitating Dutch predecessors, at Stamperia Valdonega in Verona, Italy. Discover the artist’s character r.ed monde in stop-motion animation, graphic novels, and exhibitions. Read about the artist’s traveling mosaic installation, dedicated to Title IX, that features women athletes in bikinis winning the Pentathlon 2000 years ago. Visit this site for essays and documentation about artist’s books and where to find them in public collections in the U.S. and abroad.